I admit it -- I'm a chocolate lover. Well, not just a chocolate lover ... the appreciation goes so much deeper. I guess you could say I'm a bit of an addict. And Philosophy must have known that when they created their latest 3-in-1 gift set, Just Because ... because, well, all three shower gels are scented with the indulgent aroma of chocolate. 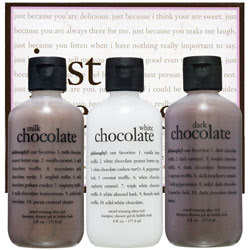 I was seriously so excited to find this set, which includes three of the brand's signature 3-in-1's (shower gel, shampoo and bubble bath) in utterly decadent chocolate scents. Pick from three 6oz. bottles of white chocolate, dark chocolate, and my absolute favorite, milk chocolate and your shower experience will seriously become incredible. And since no Philosophy gift set would be complete without the adorable gift box, these are of course packaged within a big white box with "just because" sort of sentiments written all over it. This amazing limited-edition set can be yours for only $30 on Sephora's website. Guilt-free chocolate? Sign me up immediately.